Cao Cao is the leader of the Hero Faction of the Khaos Brigade. He is the wielder of the Ultimate Longinus, the True Longinus. Cao Cao is a charismatic person, as he was able to convince many Sacred Gear users to join the Hero Faction. He also believes that it is his responsibility as a descendant of a hero to destroy beings like Devils, Fallen Angels, and Dragons which he believes are threats to human beings. In Volume 9, Cao Cao made his official appearance to Issei and his friends during their class trip in Kyoto. He and the rest of the Hero Faction were responsible for the kidnapping of Kyoto's Youkai Leader, Yasaka, under the intention of opening the Dragon Gate to summon the Great Red. This attempt, however, was stopped by Issei and his friends along with the last minute intervention of Sun Wukong. In the process, Cao Cao lost one of his eyes to a final blow from Issei. 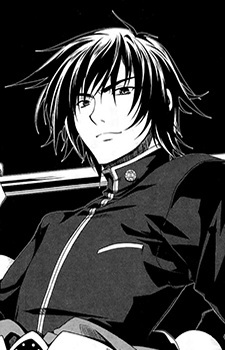 Cao Cao reappears in Volume 11, attacking the Gremory Team in order to capture Ophis. During the fight with assistance from Georg while targeting the weakness of his opponents, Cao Cao was able to dominate the battle, defeating the Gremory and Vali Teams and successfully stole Ophis' powers. In Volume 12, he appeared in the Underworld after Issei and the Gremory Team defeats the Hero Faction, challenging Issei to a fight, while Cao Cao was able to dominate throughout the fight, he lost after Issei used a bullet with Samael's blood on his Medusa's eye weakening him. In his last attempt to defeat Issei, Cao Cao attempted to use the Truth Idea but did not happen due to the will of the God in the True Longinus choosing Issei's dream instead of Cao Cao's ambition. He was then rescued by Georg who carried Cao Cao and Leonardo until they meet Indra who proceeded to take their Longinus and send Cao Cao and the other two to the Realm of the Dead. Cao Cao is a technique-type who polishes his technique to utmost pefection. He is a calculative and observant person, as he studies and researches his enemies before he battles them so he can read their movements and attacks. In Volume 9, he lost one of his eyes to Issei's attack, and later replaces the lost eye with Medusa's eye, granting him the ability to to turn anything to stone. Because he is a human, he is physically weaker than Issei and Vali, yet he singlehandedly takes down the Gremory and Vali groups while protecting Georg and Samael, which results in Vali calling him the "strongest human". His Balance Breaker, "Polar Night Longinus Chakra Valdine", is a sub-species that is much stronger than the actual Balance Breaker of the True Longinus, "True Longinus Geta Demelung". His Balance Breaker creates seven bowl-sized orbs around him, each having a different Sacred Gear ability. The True Longinus also has a forbidden form called the "Truth Idea" which can create miracles, though it depends on the user of the spear, as it is the will of the God from the Bible that decides if Truth Idea can be used.